After a controversial finish to Battle Bowl on January 5th Owner Kswa Bobbyo has announced that Megastar Mitch Napier will face The Gavel David Lawless, Esq. one on one to see who wins the KSWA Heavyweight Title Contract. The stakes have been raised as the loser of this match will not receive the KSWA Golden Triangle Title Contract that customarily goes to the runner-up in Battle Bowl. Bobby O will have an announcement in regards to the future of the Golden Triangle Contract on February 16th. KSWA Heavyweight Champion Dennis Gregory Pro Wrestler w/ Mayor Mystery will defend his title against fan favorite The BROhemoth. KSWA Golden Triangle Champion Anthony Alexander will face KSWA newcomer The Rev" Ron Hunt for the title. KSWA Five Star Champion Bubba The Bulldog (Bubba Snider) has once again issued an open challenge to anyone in the KSWA Locker Room after his successful title defense in January. KSWA Tag Team Champions Kris Kash& Shane Starr will take on The VIP's Shawn Blanchard & Tommy Faime. In other Tag Team action, T-Rantula David Younkins & BIG Country Matt McGraw battle Jack Massacre & BIG Mike Malachi. After almost kicking the head off of his former tag team partner at FanFest and a vicious altercation in Battle Bowl Zak Hunter fights Harley T Morris in a Grudge Match. The KSWA Championship Committee has announce a Fatal Four-Way Match Qualifying Match for a guaranteed spot in the 2019 Joe Abby Memorial Tournament. In this match it will be Lucio Deveer vs. Beastman vs. Officer Dan Murphy vs. Lou Martin. Also on the card will be Joey Quervo, King Del Douglas, Sly Scarpone (Mathew Foster), Trick McSorley and more! 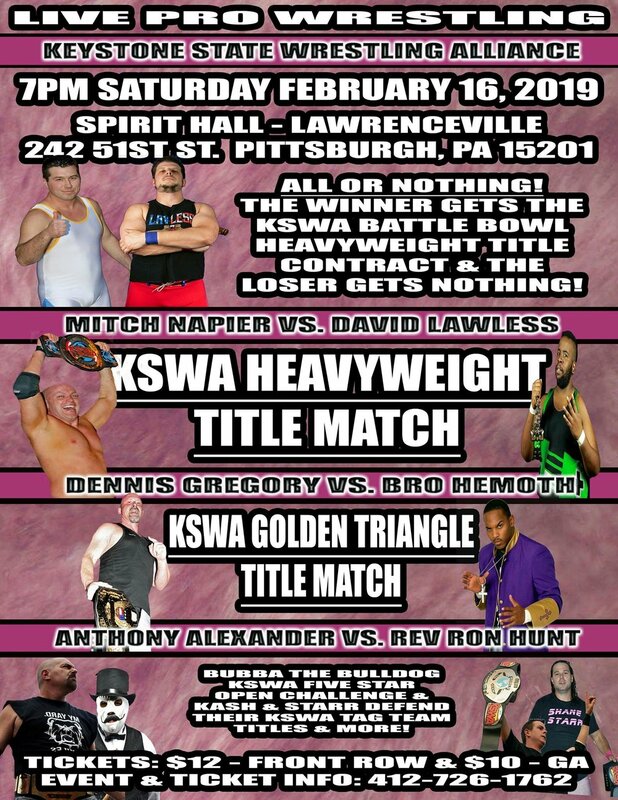 For event and ticket information please call 412-26-1762 or e-mail kswawrestling@gmail.com.